From Bulgaria with love! The multifaceted and classically trained Mario, aka NoFeaRInc, paints a beautiful and lush musical canvas in tones of G.
To enjoy more music from NoFeaRInc, please visit his YouTube channel. The votes are unanimous! The sensational Jordan delivers the real McCoy with an energetic, crowd-pleasing performance of the Jackson 5 tune. Taped for the music-talent competition AMERICAN JUNIORS. Welcome to Playlist Four of The Michael Jackson Music Experiment. Click here to open our MySpace music player and listen to the playlist. Class is now in session! The band from Istanbul kick-starts Playlist 4 of The Michael Jackson Music Experiment with a taut lesson in funk and groove! A breezy original by the former Beatle and Jackson collaborator. Saddle up, pardner! We’re rounding up ghosts and goblins in the Old West! The Moonwalker meets one of rap’s preeminent MCs. Heartfelt and original dedication to the King of Pop, courtesy of the Fort Worth, USA, singer, composer and producer. Pint-sized performers bring big-time talent to the Jackson 5 classic. Rugged, hard-edged rock from the Spain-based quartet. Stallion spirit stands proud with this rendition from Kansas City, USA. U.K. mixmaster reworks HISTORY’s lead single into a delicious slice of dance-club fury. We stroll homeward in the company of an amazing gospel-and-blues arrangement. Welcome to Playlist Three of The Michael Jackson Music Experiment. Look, ma, no instruments! Beatboxing and a cappella stylings warm up the latest installment of the Michael Jackson Music Experiment. A line from Mr. Jackson’s “Rock With You” looped into the Clivillés and Cole hit machine produces soulful, disco-flavored magic. Metal’s namesake for the harvest-day grain tangles with Mr. Jackson on the mean streets of MySpace! Cool and sophistication by the Grammy-nominated pianist and composer. Hip-hoppers for the Lord impart a vigorous affirmation of spirituality. A sweet, harmonic interlude from the Malaysian capital Kuala Lumpur. Headliners of 2009’s Rockstar Taste of Chaos Tour deliver a fresh brand of punk-influenced rock. The guitar-metal specialist takes a road less traveled on this cool and breezy detour. The architects of the C+C Music Factory add dance-floor delirium to this anthem of racial unity. We glide into the horizon on vocals from Mr. Jackson’s big sister. On March 19, 1984, Time magazine featured on its cover an oil-on-silkscreen portrait of Mr. Jackson. 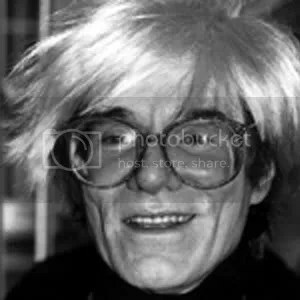 The portrait’s author: renowned American pop artist Andy Warhol. To learn more about Mr. Warhol, click here. To read the March 19, 1984, Time feature on Mr. Jackson, click here. Like spring sunshine, Sunnydeux’s song washes over our hearts, infusing our souls with warmth and abundance. To listen to more music from Sunnydeux, please visit her YouTube Channel. Raw, sweaty and, oh, so much fun! Pierce The Veil rips, rocks and rolls at the Boardwalk Club in Orangevale, CA, USA. Though it is no longer downloadable on PTV’s MySpace page, you may listen to the band’s studio version of “Beat It” on our MySpace player above. To learn more about Pierce The Veil, click here. To learn more about the Boardwalk Club, visit their MySpace site.